Charles Tomas Jacobi The Printers’ Handbook of Trade Recipes, Hints & Suggestions (London: Chiswick Press, 1891), 256. 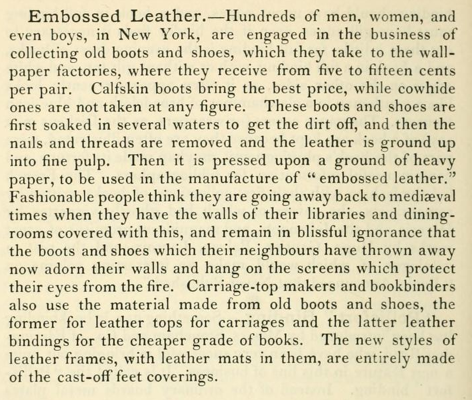 Quite possibly too good to be true, but nevertheless a delicious conceit: “fashionable people” are unknowingly hanging reconstituted stinky old boots and shoes on their walls to imagine themselves “going away back to mediaeval times”. Note this embossed leather is also sold to carriage-top makers and bookbinders. Because this type of leather is actually made of leather, it can be very difficult, sometimes, to tell it from the real thing, or an artificially grained split. Do you think this is the kind of leather used on those late 1800s family bibles that everyone has? Who knows. A lot of these Victorian Parlor Bibles have had such incredible pressure applied when they were made it is sometimes even difficult to figure out what is embossed or genuine grain!